Many of us kick off the new year aiming to conquer a number of resolutions. But Florida man Tyler Marinelli actually stuck to his. In a now-viral Reddit post, says he has lost more than 20 pounds since the beginning of the new year by eating mostly Chipotle. Unsurprisingly, he also worked out frequently, to help account for his newly ripped physique. A closer look at his reduction diet, though, shows that it’s a little bit bananas. He practiced intermittent fasting, only eating between the hours of 1 p.m. and 9 p.m. 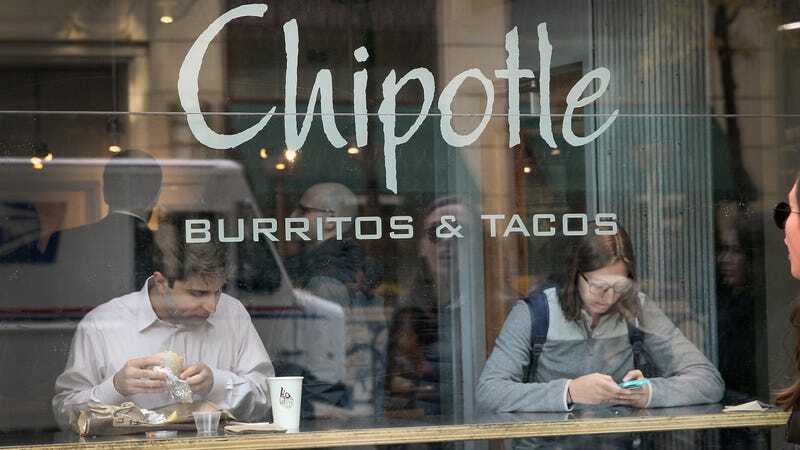 Within that time, he would only eat egg whites, almonds, greek yogurt, and yes, Chipotle every day, in the form of a particularly bland burrito bowl: 445g Goya black beans, 255g Chipotle chicken, 300g Chipotle white rice. Obviously, this guy was going for a lot of protein and a relative low-carb approach. But he’s lucky he didn’t get scurvy. At Chipotle, for example, he could have easily tossed some salsa, lettuce, literally any kind of vegetable on there and not really hurt his overall calorie total. He notes in his post, “I dislike cooking and the time constraints of it, so my meals involve no cooking whatsoever. Plus, I get to eat Chipotle every single day and still comply with my diet.” And he ends with an encouraging, “Remember, every streak starts with one day. If I can do this, so can you. Happy gains.” Many congrats on your buff physique, Tyler, but on your next lunch trip, maybe throw some pico de gallo in that burrito bowl?